We’re officially down to the wire with baby #3, with less than a month to go at this point. Giving my large size and just general uncomfortable nature – I’m not feeling up to cooking and baking as much as I have been in the past few months. But, I did find the time and energy to make these awesome oatmeal bars this week! I know apple butter may not be the first thing you think of when it comes to spring. But, let me just say that’s the wrong way to think! It’s a delicious base for a barbecue sauce, or smeared onto a crostini and topped with a little blue cheese and a slice of apple for an easy appetizer. Not to mention the classic peanut butter and apple butter sandwich that is my boy’s favorite! These bars are delicious, and easy to bring together – which automatically means a winner in my kitchen. 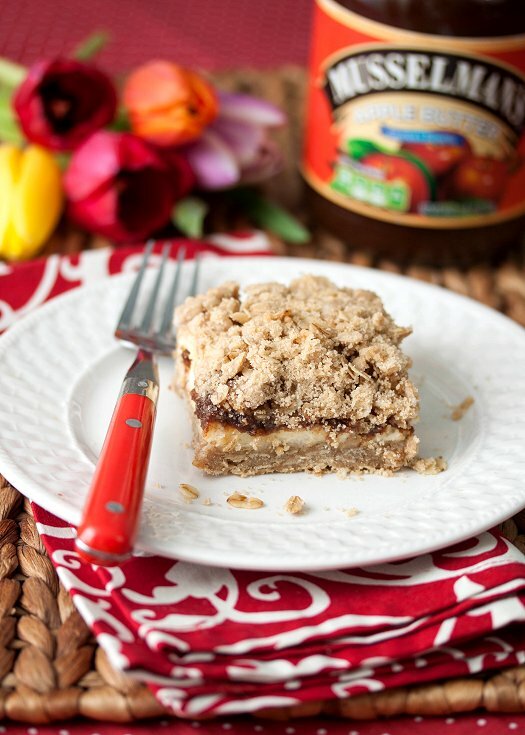 A quick crumble composed of oatmeal, flour, brown sugar, and butter is used for the base and the topping. And sandwiched in the middle is a layer of apple butter and a cheesecake filling. What’s bad in that equation? All the flavors go together just perfectly. I hope that everyone is enjoying all the gorgeous weather we’ve been having. Our crew is heading to Ocean City for the weekend – for a little family “babymoon” before our next bundle of joy arrives. Hoping to eat plenty of good food and let the boys have some fun in the sun. Have a great weekend, everyone! Preheat oven to 350 degrees. Line an 8×8-inch baking pan with aluminum foil, then spray with non-stick spray. Set aside. To make the cheesecake filling, place cream cheese and sugar in the bowl of an electric mixer fitted with a paddle attachment. Beat until fluffy. Add the vanilla and the egg, and beat for 1 minute until smooth and combined. Set aside. Mix flour, oatmeal, sugar, and salt in a medium bowl. Stir in butter with a fork until well mixed and clumps form. Spread a little over half the oatmeal mixture over foiled pan bottom, pressing with the bottom of a drinking glass to form a crust. Pour cheesecake mixture over the crust, using an offset spatula or butter knife to spread out. Then dollop apple butter over the filling evenly. Sprinkle the remaining oatmeal crumble mixture on top. Bake until crisp and golden brown, about 50 minutes minutes. Cool to room temperature and refrigerate for at least an hour before slicing into squares and serving. Disclaimer: I received a jar of apple butter from Musselman’s, as well as a lovely spring bouquet of flowers from FTD for my review. As always, all opinions are my own. Whoa maybe I am writing this comment and you are in labor???? I happen to like bar cookies and I make a lot of cookies. They are extra quick as you know. I can appreciate the effort in making these babies—yes pun is intended—-at the stage of pregnancy you are in. I wish you well my dear. Another good recipe. I didn’t have enough apple butter so substituted with raspberry jam. Good luck with baby number three.